She builds brands: That’s how Kubi Springer was introduced every time she took part in a speaking engagement. She became so successful that the three words stuck, cementing her reputation as one of the top brand developers in the world. Kubi has taken on the mission of championing women into top marketing positions, ensuring that their global purchasing power at 85% of all consumer spending, is properly reflected at the most senior levels. In this excerpt, Kubi outlines her vision to empower women, the importance of branding and how she successfully built an international reputation using those three words. It is important for all businesses to consciously create their brand. This is because branding is more than logos and creative images, branding is a business driver. It is the vehicle that entices an organisation’s desired audience to buy-into their company and therefore both small and large businesses need it. People do not buy from their heads, they buy from their hearts. Therefore businesses should always develop their brands from a place of connecting to audiences’ emotions. Ultimately, a brand is an emotional connection with your target audience. Ask yourself; how will your audience feel when they encounter with your brand? How will they feel when they use your products or services? L’Oreal understand this well, which is why they do not sell product benefits they sell emotions by reminding women that their products will make them feel ‘worth it’. What is your brand mission? Businesses need to ask, what is the purpose (or mission) for their brand. Understanding this will help inform every other aspect of brand development and brand marketing activities. For example; Facebook’s mission was to connect the world. Today one in three people who are on the internet, in the world, are on Facebook…mission accomplished. What is your brand promise? The promise is what your customers or clients are paying for; for example; Nike promises its customers that they will feel like a Number 1 Sports Athletics Person when they wear their products, which is why every time I want to lose weight I buy Nike. Whereas, Adidas promises the cool factor. Both are selling trainers, but they have two very different promises. When businesses do not define their brand, often their brand messages and marketing activities leave their market place confused and unclear, which results in lack of trust and no or limited sales. Branding is the pull – it is the reason people come to you. Marketing is the push – it is the messages that you put out there. I often refer to branding like dating; when a brand is done well its desired audience feels a pull towards it, without even understanding why they like it so much, often, they just do. But most start-ups mix up branding with marketing. They think it’s the same thing and then they spend their time marketing (i.e pushing out messages) without first creating their brand. They have not defined their brand essence, brand promise, brand mission, brand values….as a result, the brand marketing messages are all over the place. In addition to the above, the other mistake is that they do not attach metrics and clear key performance indicators (KPIs) to their brand marketing activities. They fail to identify their brand marketing objectives; failing to ask the questions; should these activities be generating new leads, securing sales, creating repeat business, enhancing brand awareness? Is it to propel your digital footprint, change perception or attract new talent? If the answer is yes to any of the above, the next question is how will you measure the success? Most start-ups businesses do not think about this and thus do brand marketing activities in a vacuum forgetting that their brand is a vehicle to achieve business success. The motivation behind SheBuildsBrands is to put the ‘SHE’ into brand marketing. 86.5% of all senior marketing positions are held by men (Source: Marketing Week), which is where we come in. We have over 50,000 women within our marketplace across the SheBuildsBrands member’s hub, social media followers and show listeners; collaboratively as a community we understand our trends, developments, needs and nuances as women. We are her, and she is us. We understand her pains and we speak her language. We help disruptive thinkers connect with female consumers….and believe us when we say dressing it in pink, won’t be enough! So the motivation was, and still is, to ensure her voice is heard, her money is not wasted and her purchasing power is not taken for granted. We are her, and she is us. And together we help businesses and women maximise their investment. The figures are from a number of sources including the World Economic Forum and Yankelovich Monitor & Greenfield Online. The ‘Women Account for 85% of All Consumer Purchases’ statistics is based on the American market, however the Women Control over $20 trillion in Worldwide Spending’ is sourced from Muhtar Kent, Chairman of the Board and CEO, The Coca-Cola Company, October 2010 and is a global statistic. I would advise a young woman starting out to gain as much experience as possible. To learn off others people’s money. ‘Entrepreneurship’ is such a buzz word but how can you run a business if you have no understanding of the business? My advice would always be to work for established and reputable brands to gain as much experience as possible and to secure contacts. People often understand the importance of good contacts, but I like the saying – show me your network and I will show you, your net worth. Who you know will aid or hinder your professional and thus personal brand success. 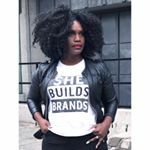 SheBuildsBrands was a very organic process, I started working twenty-one years ago, in brand marketing, as an intern, my career then moved to being a freelancer, then a contractor, followed by consulting. By 2009 I simply had too many clients and had to build a core team, as it grew we naturally turned into an agency. Even the name She Builds Brands came about in a very organic way; as a consultant, I would be introduced at speaking engagements as ‘Meet Kubi Springer, She Builds Brands’. After a while my name become synonymous with those three words. I have had the privilege of working with some amazing brands from Nike, to L’Oreal, Blackberry to MTV, but one of my favourites was our most recent campaign with Rolls Royce Motor Cars London. We did a partnership deal with them to create their London Fashion Week Campaign and Party. As part of the showcasing of some of their cars we had ‘live’ models photo-shoot during the event, with high-end models and Vogue photographers shooting the cars, whist party on-goers watched the shoot whilst dancing and having fun. It was a brilliant brand-activation project and as such attracted a huge amount of celebrity attendees and press coverage. I think Steve Jobs, Victoria Beckham and Diddy are phenomenal brand marketers. They understand the power of branding and how to truly commercials brands. For me they, plus Carolyn Everson VP, Global Marketing Solutions at Facebook would be my brand icons. So far my proudest achievements are; working in New York at Puff Daddy’s marketing agency, Blue Flame. Whilst there, as a young 20 year old, I learned first-hand the power of ‘I don’t think outside of the box, because there is no box’. The idea that there are no limits, unless I place them, set me free to see only the possibilities that a global career could give me. The second was working in Malaysia with Female Founders, helping them launch their brands into the UK and USA market. This experience taught me just how similar we are as women globally. Whilst we may be culturally different, we really do experience the same challenges pertaining to starting and launching business. It was through working within these emerging markets that I saw just how powerful female consumers are and how, if brands understand how to effectively connect with them, they could be onto a real commercial winner. Lastly, the ability to juggle being a mother (to a five year old), a wife and a boss. I have always wanted to be an example for the next generation of women that we don’t need to choose. We can have it all, whatever our all is. It’s ours for the taking. It’s not easy doing the juggle, but it can be done.